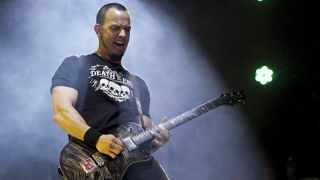 We're excited to announce that at 7pm UK-time tonight (8 August), Mark Tremonti will be taking over the new MusicRadar Guitars Twitter feed (@MRadarGuitars) in order to answer your questions live! Fresh from the release of his first ever solo album, All I Was, the Grammy-winning guitarist and songwriter behind Creed and Alter Bridge will be fielding your questions on all things music-related for a whole hour. Maybe you want to know how Mark warms-up before shows, how he keeps track of his songwriting ideas, his gear recommendations, or ask his advice about developing your playing technique. Or, perhaps you want to know what it feels like to win a Grammy, why he set up his Fret12 tuitional site, or what it's like to jam with shred-king Michael Angelo Batio? This is a Twitter take-over, so if you've got something you want to ask, just make sure that you're online and following the @MRadarGuitars Twitter by 7pm BST (2pm EDT, 11am PDT) on 8 August. When the hour comes, start sending your questions to @MRadarGuitars and it will be up to Mark to decide which ones he wants to answer and reply to them as they come in. While you're thinking up questions, check out the video for You Waste Your Time, the lead single from Mark's critically-acclaimed new solo album All I Was, above. If you like what you hear, buy your digital copy from the link below.